PHOTO: Allen Ramsey, DWCPhoto.com. Highlands senior Joe Steiden reacts after recording a huge hit in the 9th Region quarterfinals against Dixie Heights on Monday. Highlands won 11-0 in five innings. Through two post-season baseball games, this was the result for the Blue and White. 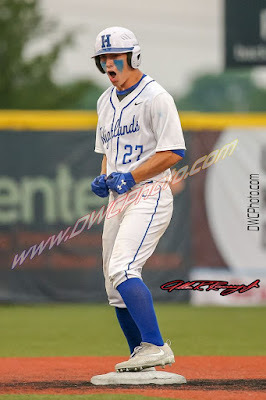 That amounted to an average run differential of 15 in two run-rulings as the Highlands Bluebirds (24-13 overall) smashed their way to a seventh straight 36th District championship. The 9th Region quarterfinal match-up against Dixie Heights (11-20) had the makings for a similar result and turned out that way. The Bluebirds run-ruled the Colonels, 11-0 in five innings at University of Cincinnati Medical Center Stadium to record their 13th straight region win and fifth straight region quarterfinal victory on a hot day. Highlands has outscored its three post-season opponents, 42-1 for an average run differential of between 13 and 14 per game. Junior Grady Cramer started the game to pick up the win and junior Steven Grimme pitched the fifth inning. 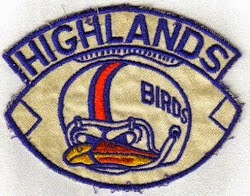 The Bluebirds played error-free defense behind them. Cramer struck out four, walked one and allowed just two hits. Grimme walked one and struck out two allowing no hits in his inning of work. "You have to go out with confidence," Cramer said. "You have to keep your head up when something goes wrong and do what you have to do to get it done. All the guys throw strikes. When that happens, it turns out really well for us." Highlands has some options for the rest of the tournament. Seniors Drew Rom and Hunter Dreves are still available. Sophomore Collin Hollingsworth said the reserves are preparing as though they are starting games. "You have to be ready to go," Hollingsworth. "I love (the coaching staff's trust in the pitcher). They are 100 percent for everybody. It doesn't matter who they play. They have faith in them." On the other side, Dixie Heights used six different pitchers. Senior Josh Adams took the loss for the Colonels starting the game. The six pitchers combined to allow 11 walks and eight hits to go with nine earned runs and four strikeouts. Dixie Heights committed three errors defensively. "They've done a good job of worrying about the next pitch," said Jeremy Baioni, Highlands Head Coach. "They kind of realized after a pitcher in the first, a pitcher in the second, they were going to see a bunch of different arms and knew they wouldn't have a ton of time to adjust to each pitcher. They did a good job of being patient. That was the good thing. In the region tournament, anything can happen and nothing really fazes them. They weren't upset they only faced one guy for one at-bat. They did their job and had great approaches." Senior Tyler Gulley led Highlands going 2-for-3 with two doubles, two runs batted in and a run scored. Senior Sam Hennigan went 2-for-2 with an RBI and two runs scored. Junior Bryce Ziegler had two RBI with senior Joe Steiden and sophomore Ethan Kavanagh also scoring twice. Ziegler, Steiden and Kavanagh all had one double each. "The whole regular season is preparation for the regional tournament," Hennigan said. "We just all want to win. We hate to lose. We make sure everyone is on task. The seniors are being leaders for everyone else to follow." Senior Carson Fitters, Kavanagh, Ziegler and junior Cooper Schwalbach drew two bases on balls each with Steiden, Hennigan and Rom drawing one each. Fitters recorded the lone stolen base of the game. Highlands scored the only run it needed in the first inning. Gulley doubled in Kavanagh. The Bluebirds plated two more in the second. Two runs scored when Hennigan singled to center and Dixie Height senior center fielder Paul Guenther let the ball get by him allowing two more runs to score giving Highlands a 3-0 advantage. The Bluebirds put the game away with eight runs in the fourth inning. Ziegler doubled home Steiden and Kavanagh for the big hit in that inning. Highlands earned a third meeting with the Beechwood Tigers (22-10) in the 9th Region semifinals Tuesday back at UCMC Stadium. Highlands won both meetings against the Tigers during the regular season on April 12 (9-6 in Fort Mitchell) and April 30 (2-1 in Fort Thomas). Game time was pushed back to 8:30 p.m. over heat index issues.